Question 10 asked about which programs students were enrolled in. Nothing too exciting there. 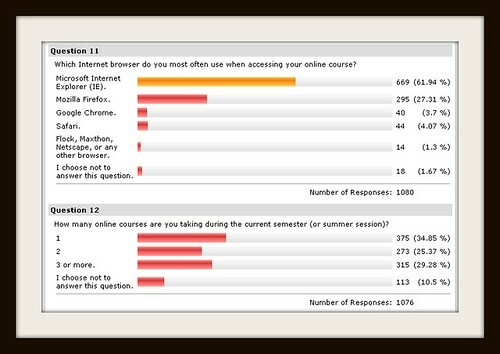 Nothing much different about question 11 where students indicate how many online courses they are taking during the current semester. We have lots of students who take only 1 or 2 online courses to fill in their on-ground schedule, plus we also have many students who are attending other colleges and taking one or two courses from us that count toward their degree programs at other schools.